Sometimes people ask if it's worth the time and money to create original content. The better question is, do you provide enough value over your competitors to earn a customer's business? The best way to convey that is by providing a superior experience, often through excellent content. 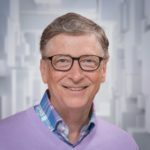 As predicted by Bill Gates (and others) in the 20th century, content drives the modern marketplace. Advertisements are still around, but great content is now an essential component of most industry leaders. 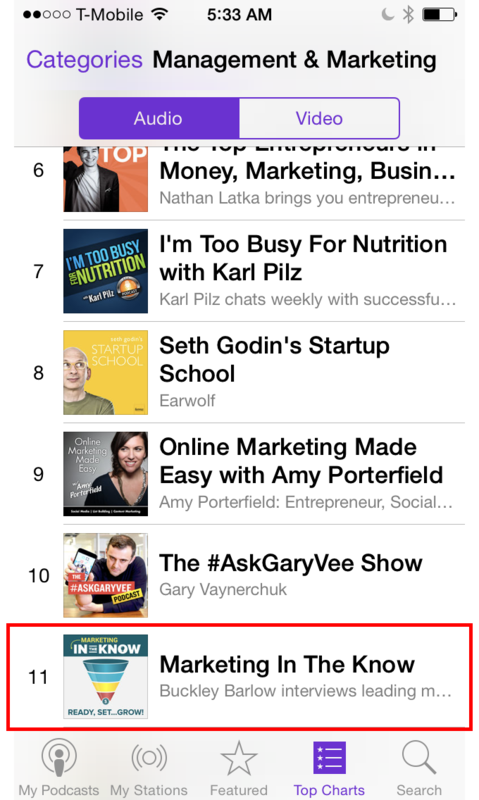 Creating a new podcast in a crowded Marketing category wasn't the greatest idea, but I made it work and got great results. Not by working harder than everyone else, but by improving the experience for my guests. Based on my experience and several data-driven studies, long-form content consistently outperforms shorter content. It gets more shares, more inbound links, and returns the greatest ROI. Engagement doesn't mean putting occasional articles on a company blog. Media in the form of podcasts, videos, livestreams, and many more options can keep customers interested in a brand before, during, or after a purchase. When people talk about content marketing ROI, what they really want to know is, “Is content marketing worth our time and money?” For my money and my client’s money, the answer is a resounding yes. And since you’re reading this, you probably have a good idea why content marketing is so crucial, and what the possible returns look like. Still, there’s hesitation about how much to spend and the best approach to producing content. I’ve worked with enough C-Suite executives from top Fortune 500 companies to know the scrutiny every marketing strategy goes through. When it comes to content marketing, if you’re going to dedicate a good chunk of your resources, you’d better see that investment pay off. So how do you make it worthwhile? How do you optimize on returns like a surge in traffic and lower bounce rates? 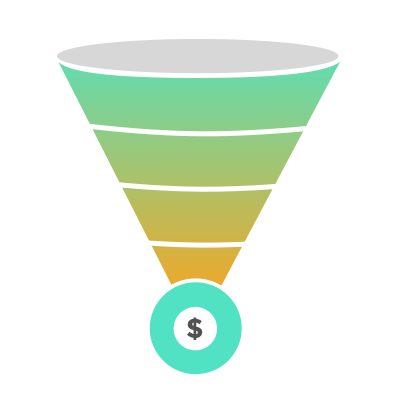 How can you ensure that your content strategy succeeds and turns into a revenue generator rather than a budgetary black hole? 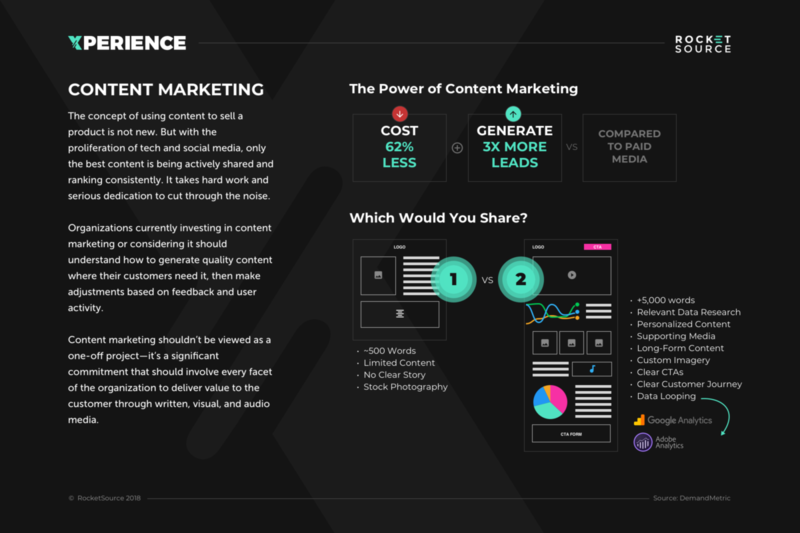 Before I dive in too deep, let me start by giving you a quick primer on why content marketing is a fundamental necessity for so many growing companies. You might already have a good idea, but it’s worth repeating. Then, I’ll dig into the really good stuff—the insights I’ve gleaned from my own experiences, as well as insights from some of the best thought leaders in the content marketing realm. Today, brands in every industry are finding ways to deliver valuable content using articles, audio, reports, ebooks, videos, social media, and more. Every company, in some way, is experimenting with content marketing. But that’s where the similarities stop. About seven years ago, businesses were jumping on the content marketing bandwagon because it was a way to game the Google algorithm and gain visibility. That’s no longer the case. In fact, much of the content found online today has become more like spam because it’s written so poorly. It’s written to feed the Google robots with keywords in hopes of ranking. But here’s the reality. Google and consumers have caught onto the game and guess what? They’re not playing. Google has changed their algorithm and now, keyword dense content that doesn’t add value is getting buried in the search engine results pages (SERPs as we call them in the industry). Consumers have also adapted and the way we search has changed dramatically. Today, Google is used as a verb instead of a business name. If we want to know the answer to a question, we “Google” it. Voice search has also picked up. We, as consumers, ask virtual assistants questions in full sentences like Siri and Alexa are real people instead of typing in awkward keyword phrases into a search box. And the place where we search has changed too. In October 2016, the percentage of mobile searches (51.3%) officially surpassed the number of desktop searches (48.7%), according to web analytics firm, StatCounter. 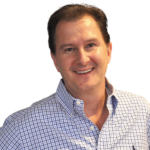 Times have changed and content marketing must change with it. As I like to say, if you want honey, you go to the hive. If the bees move, you move along with them. Well, my fellow executive, the bees have moved and if you want to keep up you have to adjust the way you attract them or you won’t capture market share. Put differently, you’ll notice that no one says, “maybe we should have a website” anymore. It’s become a non-negotiable. Today, content marketing is the same. Yes, everyone’s doing it, but that’s not the point. The point is that the consumer needs and demands it, which is why it’s such a fundamental necessity. Now, remember, content marketing isn’t just about creating material that attracts leads—it’s about planning, producing, and distributing information to your customers, both existing and potential. Why such a heavy lift? Why isn’t it as simple as hitting publish? Because it’s what the market demands. Consumers want it and we, as businesses, have a responsibility to give it to them. Today, if you want to stand out, you must become your own media company. Standard content just doesn’t fly anymore. 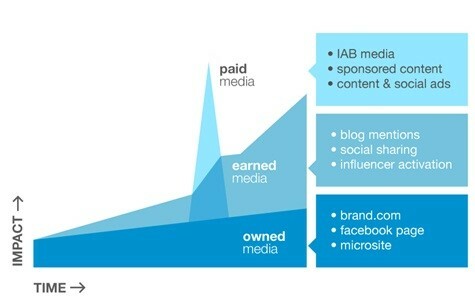 Unlike traditional paid media (ads, PPC, etc. ), content marketing is about investing in marketing creativity. Something I’ve seen time and time again is that companies finding success in their content marketing efforts aren’t just going through the motions. They don’t allocate a small budget to “explore” it and give up after six months—they are wholly committed to pulling in their ideal customers with valuable content that addresses their needs. They have a strong understanding of the pieces that are needed (see the 3 Ps) and where everything fits into the StoryVesting framework. And they know the role content plays in supporting the 3 Is—invention, innovation, and improvement. The companies that are succeeding in content marketing are, in essence, their own media companies. They become publishers by nature, putting in the work to create great content which garners an engaged audience and delivers leads. They might even hire a dedicated audience strategist to take the lead on content marketing efforts. But it doesn’t stop with lead generation. These companies treat content generation as a business process that is just as important as engineering or sales. They know that owning media and earning an engaged audience is more effective than relying on paid media. They are actively learning how to better understand the ROI of content marketing. In turn, these results can inform leadership on what’s working, what isn’t, and what changes can and should be made. And he couldn’t have been more right. The return on investment of content marketing is substantial. Paid media remains an important part of gaining exposure and traction, but owned and earned media is where your unique content—and the value it contains—truly shines. The original essay can now only be seen using the Wayback Machine, but the sentiment remains just as true today as it was then, and there’s a wealth of information to support that claim. I think he nailed it here. The Internet is an incredible platform for spreading information between users. 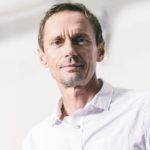 But at the same time, the door was also opening up to brands, who could stand out from the competition, create value, and generate revenue by building and sharing content. Since he wrote this essay, this prediction has been proven true time and again. 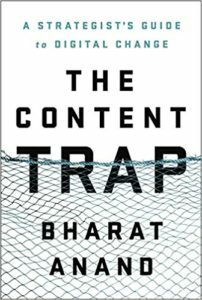 One of my favorite books detailing how content is being used to fuel growth is The Content Trap by Bharat Anand. This book does a fantastic job of solidifying how content answers a significant need today. 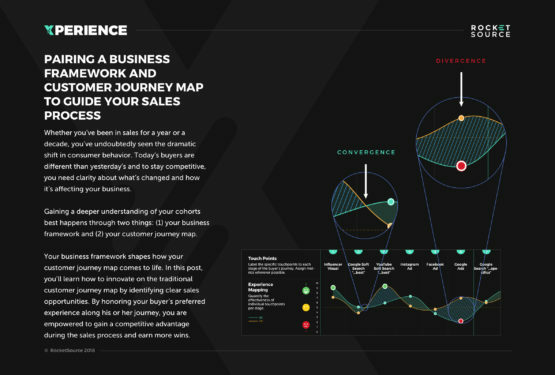 It serves customers the answers they’re looking for in their ever-evolving customer journey. This search goes way beyond optimizing touchpoints with content. It’s all about using content to optimize the buyer’s journey and that’s done by turning your business into a publishing house of valuable information. I’m not alone in loving this book. 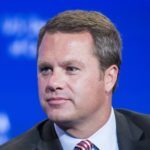 Doug McMillon, Walmart’s CEO, called it his favorite book of 2017. I highly recommend adding it to your collection, but for now, just add it to your wishlist and come back here. I want to take a closer look at this beast called content marketing and the return on investment it promises. Now, what I’m going to show you is not for the faint of heart. This isn’t a quick solution to solve all of your growth marketing challenges. 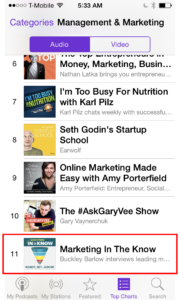 It’s not a simple roadmap to 10x your revenue streams. It’s downright difficult. But if you’re willing to put in the work, you’ll be leagues beyond your nearest competitor. I admit that sometimes I have to pinch myself because I feel so lucky to have fallen into this professional path. But it’s not without a lot of hard work. I love creating new ventures, new business divisions, and new products and services, and I’ve had quite a bit of success because of the strategy and approach I’m about to reveal to you. The thing that lights a fire in my belly brighter and hotter than anything else is watching small ideas grow into something that affects the daily lives of people around the globe. These types of ideas don’t solve the simple problems. They require that my team and I dig into complexities. Sometimes this is a product of my own from our Digital Lab and other times it’s helping to insulate a client with an innovative mobile IoT app. In either case, I love the challenge because I love the value it delivers to the market. The value is why I enjoy content marketing, too. Done right and you’ll communicate your value without having to sell your value. That’s an important distinction. If you communicate your value, your buyer sells themselves on why they should buy from you. You fuel loyalty, referral business, and growth. On the flipside, if you use your content to push people to buy your product or service, you’ll probably see some revenue from your efforts but you won’t see the returns that you’re capable of achieving. Content is your not-so-secret weapon. It’s the best method for building your credibility and driving social proof as a specialist in your field. It’s the ultimate differentiator between good companies and great ones. And like most anything in life, your consumers can either have an exceptional experience with your content, or a poor one. Outdated content marketing practices—where the sole outcome was to drive traffic—generally lead to poor experiences. Update your strategy to focus more on a value-driven experience and you have a recipe for success. This may come as a surprise to you, but optimizing the technical side of your online presence for search engines has become an increasingly obsolete practice. That’s because many applications and SaaS products do the heavy lifting for you, so it might feel like there isn’t a whole lot left for you to do. What can’t be automated is your content. That’s why content marketing and SEO have become so closely intertwined. But using content to rank higher on search engines has changed dramatically over the years. In the past, it was common and considered a best practice to post articles stuffed with keywords on spammy websites in an effort to game Google’s algorithm and rank higher. The focus was on the machine instead of the human. The devious practices that were previously used to entice a click are now more transparent and trashy looking. Today’s consumers, as well as Google, have lost patience with this practice and have become smarter at sifting out this type of strategy. Google has been continually tweaking their algorithm to accommodate the consumer’s desires and behavior patterns. 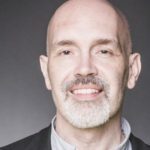 Instead of only focusing on exact keywords that can be spammed, Google now (according to Rand Fishkin and others) adds search intent to the mix. For many search terms, Google also focuses on location, to provide the most relevant results. The goal is to give a better experience to their end consumer, the searcher. So, the question remains: How do you optimize your content marketing so that you rank high up on the SERPs now that the old methods are less and less effective? The answer: You must deliver a stellar experience. One of the core parts of content marketing is to provide value to the end consumer. But, without a positive consumption experience on your website, your message will get lost. People aren’t patient anymore. And honestly, they don’t have to be. All the noise on the internet today brings a wealth of sources with it until consumers rarely have only one option to accomplish even the most obscure tasks. The smallest interruption in their path to find information or make a purchase is enough to send them running to your competition. Take sales pages as an example. When you’re running an ad campaign or rebuilding your home page, you want to give consumers the information they need to make a decision. Your content should cut through the noise and focus on what they want to know about your brand, while also being rich and comprehensive. 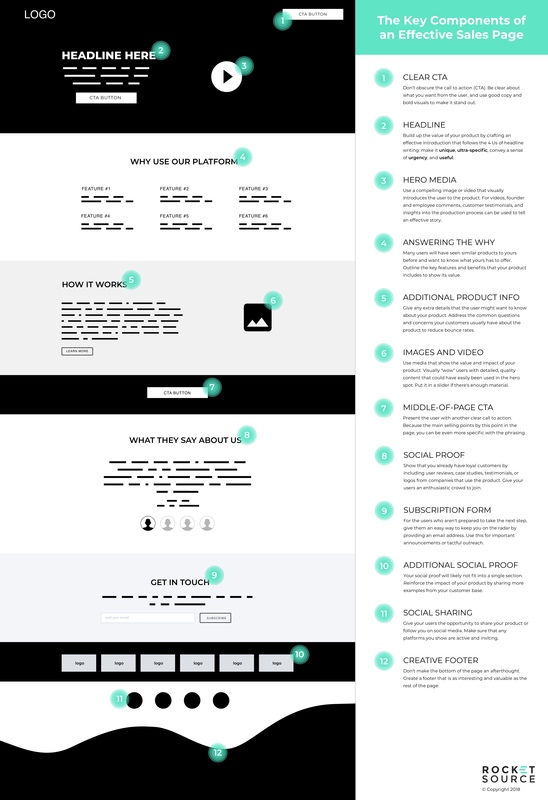 Below, you’ll see a template of a long form landing page, the kind that may be used to help promote and sell a product. It may seem like a lot, but every element serves a crucial role in conveying information to your users. Typical short form landing pages may have only three or four of the elements shown above (such as a header, some basic product info, and some images); and many pages will not use those elements to their fullest potential. Getting your landing page to the point where it includes all the necessary elements and communicates quality and cohesiveness in all of them, will make a world of difference in the ROI of your content. Not only will your ROI go up, but quality landing pages assure users of your competence as a business, and keeps them from bouncing to your competitors. A beautiful and engaging landing page makes them happy to stay onsite, which is more crucial than ever now that Google has found ways to incorporate the quality of experience a person has on your website into their search results. They judge this using a variety of factors, such as the time spent on a page, the number of pages visited on your website and other indicators that show a person is getting value out of what you’re providing. But the priority isn’t only to keep people on your site longer, and represent your brand’s quality, but to also educate the consumer. Balancing the person’s experience on your website with the right educational content takes strategy—loads of it. In order to rank consistently, anyone who touches content marketing or SEO must deploy a smart approach. Let’s talk about how. Now, I don’t claim to be the best writer—far from it. Still, I’ve created many websites that rank routinely on the first page of Google, and I’ve helped many large corporations craft a strategy that enables their content to rank consistently. You don’t have to be an incredibly gifted writer or have a team of seasoned veterans to succeed in content marketing. What you really need is an end-to-end team that understands the value of the customer journey. 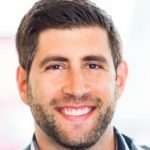 These are the people who can pull out the missing pieces from your consumer’s experience and deliver the type of value they’re looking for when they arrive at your website. This is so much easier said than done—I get that. This isn’t a one time exercise that you can implement and let run on forever. 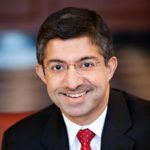 It’s an ongoing work in progress that requires you to continuously iterate and upgrade the customer’s experience. This isn’t accomplished simply by answering the phone when customers call—you need to communicate with them on a deeply personal level. Telling your customers what they need simply doesn’t work. You need to engage with them, listen to their needs, understand their motivations, and turn that into the kind of content they are looking for. And that process starts with empathy. What does empathy from a brand to a consumer look like in action? Let's look at a quick example. As you likely know, empathy is very different from sympathy. Empathy involves walking in a person’s shoes and getting into their mindset at their most private moments of the day. It means anticipating the needs and obstacles of a customer before they even experience them. Sympathy, on the other hand, is a reaction acknowledging what someone else is going through. It’s a superficial response when it comes to your consumer’s problems. It also happens to be the most common response businesses give when developing and marketing a product because it takes the least effort. And sure, we can all appreciate a little sympathy at times, but the difference between sympathy and empathy is as expansive as the difference between anticipating, and merely reacting. I’m not assigning blame here. I get why so many businesses offer sympathetic responses. The typical tools we’ve been taught to use in marketing, such as buyer personas, generally lead to sympathetic responses. 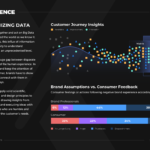 Now, I love buyer personas as a starting point for getting to know a customer, but it shouldn’t become your end-all data set for understanding how your company fits into their life. Empathy is a little harder to conjure up in growth marketing because it’s so difficult to quantify. How do you put together a data set that accurately explains what a person is going through before entering your store? There are ways to do it but they’re complex and time-consuming, and as mentioned, require constant iteration. One of my favorite marketing tools to inspire a more empathetic response in your content marketing is an empathy map. Empathy maps are one way to change the natural knee-jerk response so often given when faced with another person’s problem. They go beyond the superficial demographics of age range, occupation, and salary. Instead, it forces you to dig into what’s happening inside a person’s head when seeking out your business. But a standard, simplified empathy map only scratches the surface of the dynamics at work here. At RocketSource, our empathy map starts with the employee’s feelings, thoughts, etc. Why? 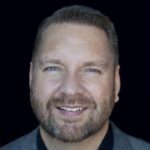 Because the employees throughout an organization—from engineers to product managers to support reps to social media managers—have a unique relationship with the brand that requires just as much maintenance as the customer/brand dynamic. Your employees are also constantly interacting with your customers, either directly or indirectly representing your organization. Employee retention is tied to customer retention. We also start at the top with what each group is feeling, because it’s the most difficult part to quantify. 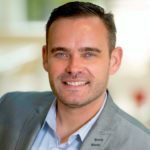 Emotional triggers and associations are a huge factor in the customer journey, and unless the members of your team all have PHDs in psychology, it’s probably not being fully acted upon. It takes time and effort to map everything out, but the exercise is only valuable if you can put yourself in the shoes of your customers. Before you can have any kind of inkling about what your customer needs from you, you have to know your customer inside and out. You have to know what they want. You have to know why they want it. And you have to know what they’ll consider valuable from you. Empathy maps should also ideally be applied to segments. If you’re running an auto dealership and someone calls or comes in, it’s probably a good idea to figure out where they’re coming from—a first-time car buyer will require a different experience compared to an expert. If you try to approach them in the same way, they’re likely to get confused or frustrated very quickly. Considerations like these are just the most basic starting point for how you design and execute your content. But this starting point leads to deeper, insightful, business-changing strategies. The better your team strategizes, innovates, writes, curates, designs, codes, and implements on the customer experience, the more likely it is that your team will win over the competition. And that process starts with understanding and empathizing with your customers. That part is obvious and you are probably already acting upon that. But there’s more you can do and that’s what I want to show you here. There’s a common misconception out there that traffic drives ROI, and to get that traffic you need to produce massive amounts of content. I disagree, and I’ll explain why. 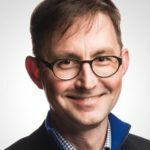 At In The Know, an educational website I created to help forward-thinking teams learn how to navigate the modern ecosystem, I have only 21 posts (as of this writing). Many people in the content marketing industry would consider that measly, and it kind of is. On top of that, my traffic numbers are relatively low. I don’t have millions of visitors per month, I don’t have a very high domain authority and it’s definitely not in the top 100k as far as traffic goes—and that’s okay. These twenty-plus posts have paid off because they’ve brought quality traffic—enough quality traffic in fact that with them, I’ve generated just under a million dollars in gross revenue—a number that continues to grow as the right people find the content. I know these numbers might sound unbelievable. “Millions in gross revenue” and “twenty-one blog posts” don’t seem like they can belong in a sentence together. And that’s why I’m laying out this example—not to brag, but to really dig into this counter-intuitive, brilliant, content marketing approach. This is where true content marketing ROI lies—in attracting the right audience. The trick I used—which isn’t a trick at all—is that I wrote valuable content based on a data-driven strategy. I wrote the kind of content that resonated with the people I serve. I wrote what they needed to hear at a time they needed to hear it. I optimized my posts, sure, but I did so with the goal of showing up in the place where they were looking and met them head on with so much value that they were inspired to read, share, and refer others to my work. The word-of-mouth marketing was an automatic outcrop of me delivering exceptional work. This is an important point and I believe it often gets overlooked in content marketing discussions. Content marketing is about so much more than simply publishing words on a webpage. It’s about the experience a person has before, during, and after she leaves. The words and messaging are important, sure, but so is the way the person finds you, the design she’s met with when she arrives on your website, and the way you follow up with her on her journey toward buying from you. The success of In The Know wasn’t a fluke, which is why we’re deploying the same strategy here at RocketSource. I know it works because I’ve seen it work. We’re not a content factory in that we aren’t focused on churning out blog post after blog post. Instead, we’re limiting the quantity of content and shifting to have a laser focus on the quality of content we create. Every piece is written with the why in mind. Why create this content in the first place? Why does the person need to hear it? This is the stuff that’s generating leads. This is the stuff that’s nurturing those leads along in their buyer’s journey. And ultimately, this is the work that’s closing those leads automatically, without needing a sales person to enter into the mix and do the job for us. That’s right. 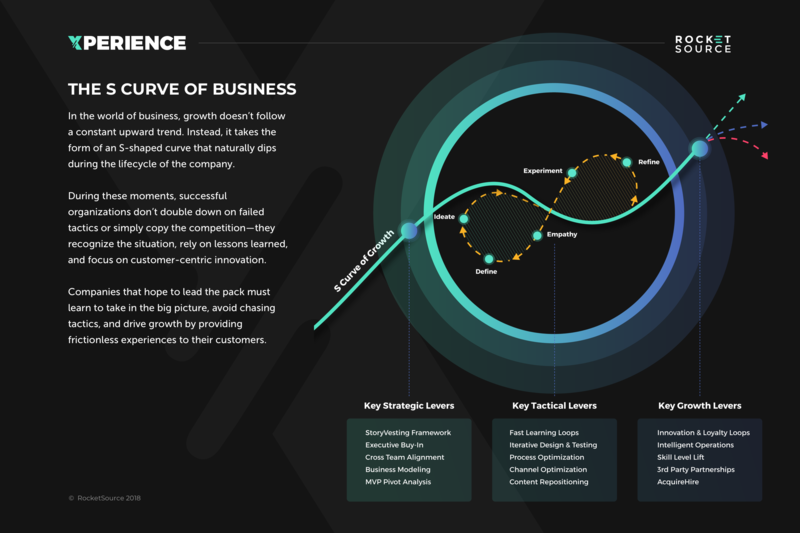 We have virtually nixed the traditional sales and onboarding team at RocketSource in exchange for a better customer experience. This strategy has almost become a second nature to me. I choose to compete with the high-powered likes of McKinsey, Harvard, and Econsultancy. 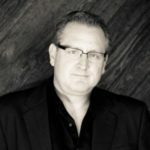 And I’ve managed to routinely build multi-million-dollar businesses and 10x the ROI of content marketing in almost every organization I’ve started based solely on this uniquely data-driven approach to content marketing. Your next question might then be, who is this Buckley guy, anyway? You probably haven’t heard of me before, and that’s somewhat by design. Besides the occasional podcast, I sort of fly under the radar. I don’t regularly keynote public events on content marketing, growth hacking, digital transformation, customer experience and the like. I’m not a LinkedIn influencer, and I don’t write prolifically for places like Inc, Entrepreneur, or the Huffington Post. But I do consult. 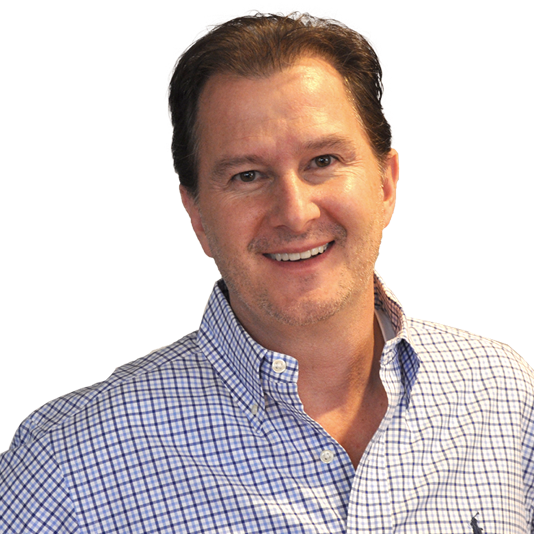 I advise and operationalize complex and large-scale initiatives for some of the most well-known and disruptive brands in the world. And when I do keynote, it’s usually for private events and behind closed doors. In other words, I don’t just talk—I do. I have no problem with keynote speakers or prolific writers. But in my opinion, you’re either going to talk about doing something incredible, or you’re going to get your hands dirty doing it. Trying to do both will drive you crazy. It’s that simple. The proof, for me, is in the experience, which is what ultimately drives the revenue. I’m deeply rooted in consumer psychology and customer experience. I’m a firm believer that innovation happens when people know what a consumer wants and exactly how they want it delivered. 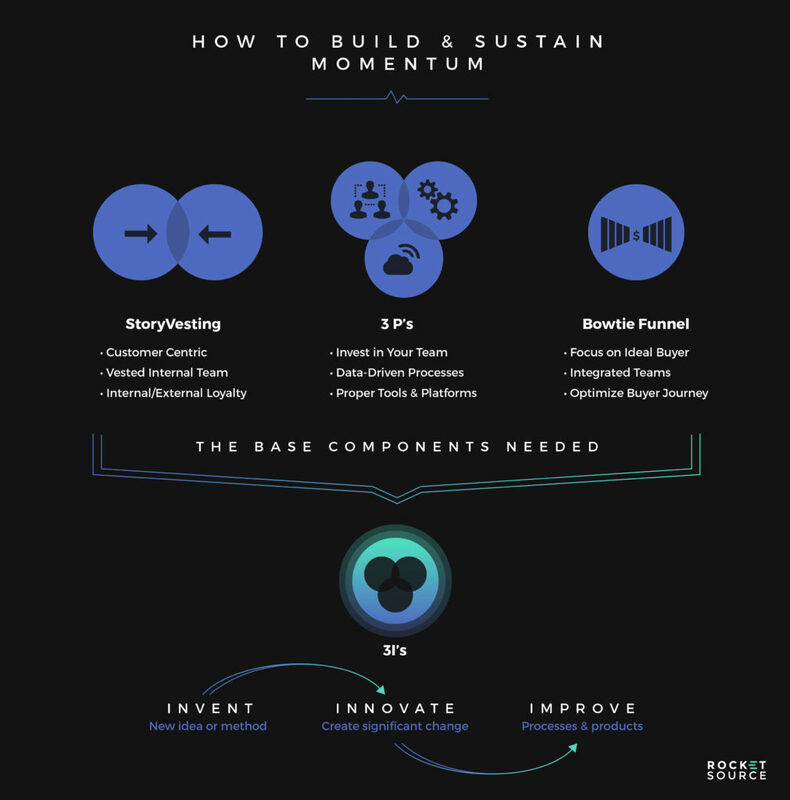 Success boils down to who has the best vision, the best execution, and the best ability to keep and sustain the lightning in a bottle: momentum. It’s pretty simple, actually. But it’s not all about where my content ranks in search results or KPIs. It’s all about delivering an exceptional experience through content and using that to drive ROI. This is all big picture stuff, so let me give you an example of what this looks like in action. 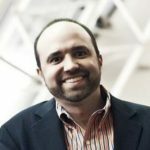 A few years ago, I started a growth marketing and digital commerce podcast. I had fresh ideas to share but I knew I was up against some stiff competition with an established audience and a wealth of content. I was able to schedule some incredible guests, but I knew that the only way I was going to climb up the ranks and gain my own audience was to stand out from the crowd. How could I do something different from everyone else and impress my guests? 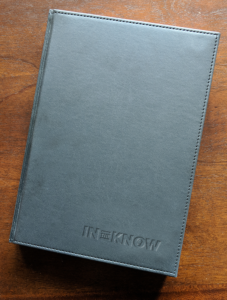 Ultimately, I decided to add value to my guest’s experience by sending them a leather-bound journal as a personal “thank you”. Of the people I sent the journals out to, around 90% wrote back with sincere appreciation and said that no one had ever sent them a tangible gift. They were so impressed by the experience that they reached out and asked what they could do for me. So, I took them up on their offer and asked for an honest review of the podcast. I also asked for them to refer anyone else in their network who might be interested in listening. To my surprise and delight, many went above and beyond that ask by reaching out to their email lists and co-promoting the podcast alongside me. The end result surprised me. My podcast soon appeared in the New and Noteworthy section and ranked #1 in three different categories. This happened not once but twice. And for a brief period of time, I hit the #11 spot in Management & Marketing. The lesson here is this: Experience matters. Action matters. Showing your visitors and the people consuming your work that you care enough about them to bring true value will pay off in dividends. Quick recap: By now you should know that I practice every word I preach. I’ve built several multi-million dollar companies using this same approach. I’ve also taken it to Fortune 50 companies and seen success. It’s a simple strategy, really—deliver value with every piece of content you produce and you will see a healthy return on your investment. What isn’t simple is how to put this strategy and plan into action. That’s what I’m covering next. Let’s get to it, shall we? Have you ever read something and could hear a person’s voice in your mind as you did? Or have you ever watched a video and felt that the person on the other side of the screen was speaking to you directly? That’s personalized content and it’s absolutely the most important type of content getting created today. I stress the importance of personalization because we live in a world of noise. Consumers listen to podcasts as they scroll through their newsfeeds and see GIFs intertwined with sponsored posts. People talk on the phone while driving and taking in the billboards around them. The world is filled with distractions and as a business, if you want your content to get in front of your customers, you have to go to great lengths to prove that you’re worth their attention. In content marketing, that means making your content feel more personal. Now, when I say personal, I don’t mean you need to expose your dirty laundry. Quite the opposite. The content instead has to feel as if you’re writing it for the person reading it. Even when thousands of people consume what you’re saying, it has to feel like a one-on-one conversation. This is not an easy thing to do but there are a few tools out there that make it a little bit easier. One that I’m very proud of is the new sound bar we’ve built and are adding to our posts. This sound bar shows the reader a summary of what they’re getting into by reading the article and has a personalized audio message from me, the author. Personalization isn't just about tailoring the content to match your customer's needs, but infusing the content with your own personality. Let me explain why this is important. Since introducing our author voice samples, we’ve found that many people find the soundbar easy to engage with. If you haven’t tried it yet, go ahead and give it a shot. Click that play button above and you’ll hear my voice speaking about this very post. When you do, and then you come back to read the rest of the post or dig into the details a little further, I’m willing to bet you’ll continue to hear my voice as you read. It will feel more like a conversation than a one-sided lecture. 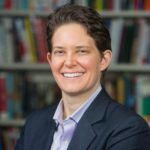 Hopefully, you’ll get the sense that I’m sitting across from you in a conference room chatting about ways your business can grow using personalized content, or whatever the subject matter may be. For example, releasing a meditation app for mobile devices may not seem all that original. But the team over at Headspace decided to spend the time and resources to build The Orange Dot blog and populate it with resources on life tips, health articles, and even a regular podcast. People who come across an article on losing a loved one from a Google search may end up trying the app and becoming a loyal, long-term customer. But that doesn’t mean you should run out and create an online publication or a podcast. The goal of personalization isn’t to disrupt a person’s day but rather to add to it. Interruption-based marketing is taking a backseat as more consumers start to realize the game marketers are playing. Instead, they want to get value out of what they’re consuming, and to do that there needs to be a personalized touch to the message getting delivered. I mentioned earlier that there is a lot of noise in the market today. That might lead you to believe that it’s difficult to reach people, or that consumers have short attention spans and want shorter content. But since most of the noise comes from short content pieces, it’s the longer content that stands out, often leading to better results. Long-form content is where I’ve seen the best results, and is ultimately where I put my time and budget. If you’re reading this, odds are you’re in a business that offers a product or service that solves a pressing problem for your customers. It’s okay if your introductory pitch says something to the effect of, “we’re the best at X,” but you need to have content that goes well beyond that—you have to show that you understand exactly what they’re feeling and what keeps them up at night. You have to use their language, demonstrate that you have the means to resolve the issue and that you’re the best option available. That’s not easy to do in 500, 750, or even 1,000 words. Now, this doesn’t mean that every article out there should have thousands of words. I think all of us have searched for a simple answer and found a lot of fluff with little or no substance. I can’t tell you how many times I’ve searched for a recipe just to arrive at a page that is 98% exposition on a recipe’s origins, what tools they use to make it, how easy and delicious it is, and 2% what I’m actually there for. In that case, less is definitely more. But the role of many companies today is to answer the very difficult questions. At one time, someone could make a living going door to door selling encyclopedias that contained what was then considered a wealth of knowledge. Today, all of that information (and much more) is available for free over on Wikipedia—but there’s a world of difference between “what’s the fastest land mammal” and “where should we put our ad spend.” When it comes to researching complex issues online, I’m willing to bet that most of us would rather find one detailed, all-encompassing source than ten brief, mildly insightful articles. In the past, it was enough to put out a formulaic article every now and again targeting your main keyword, even if the content was mostly the same. The problem is, everyone has caught on to that practice, especially the major search engines. Short-form, shallow content just isn’t persuasive enough to convince people that you’re the best answer to their problems. Converting those users into your next clients is where long-form, personalized, customized content comes in. Take HubSpot as an example. 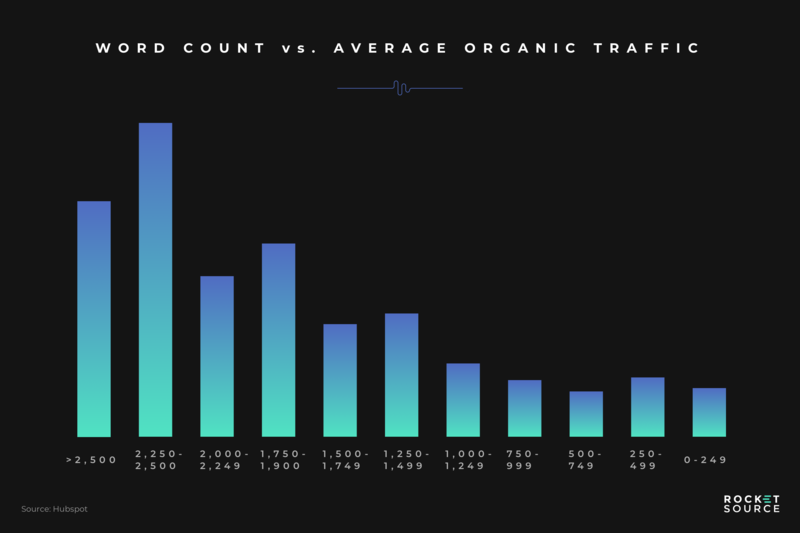 They found that their long-form content—articles over 2,250 words—averaged more organic traffic than shorter content. That goes directly counter to the belief that brief snippets are the best way to attract readers online. People are seeking out valuable content, and to provide true value, you usually have to dig deep on subject matter. This point was reinforced when Hubspot analyzed the number of backlinks each blog post received. 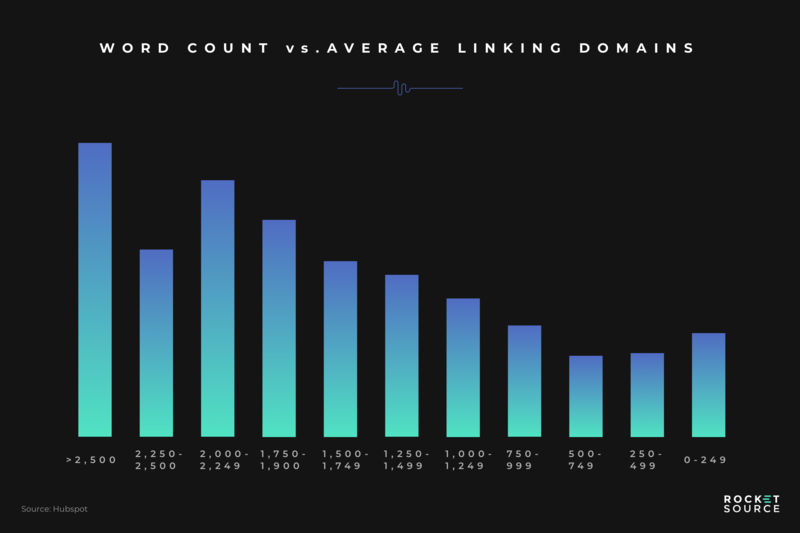 On average, blog posts over 1,750 words had more backlinks. This is important for two reasons. First, it’s a key driver to ranking higher in search results. And second, it shows that others found the content valuable enough to link to. Again, the longer and richer the content, the more value the reader finds in it. And what about that share button? It takes a lot to convince someone that your content is worth linking to or sharing with their peers. When a reader shares on Facebook, LinkedIn, Twitter, etc., they are tying that content directly to their identity. The posts they put on their profile reflect back on them. Likewise, the posts an organization puts on their social media accounts reflect on the overall brand. In order for the content to be shared it has to resonate on an emotional level, and since long content tends to be linked to more often, we can see its ability to resonate in action. Statistics from other organizations also support this conclusion. 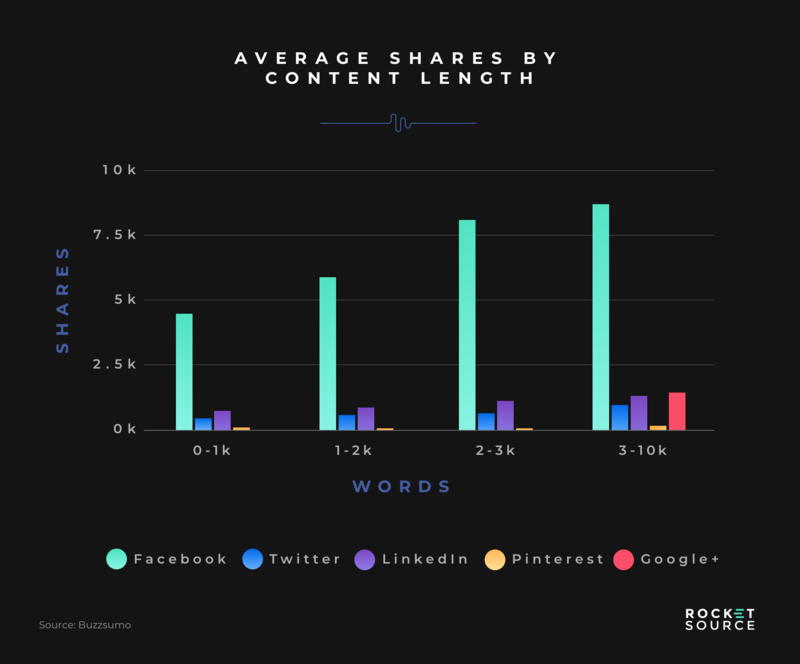 A joint study from OkDork and BuzzSumo showed similar results with long-form content and social shares. 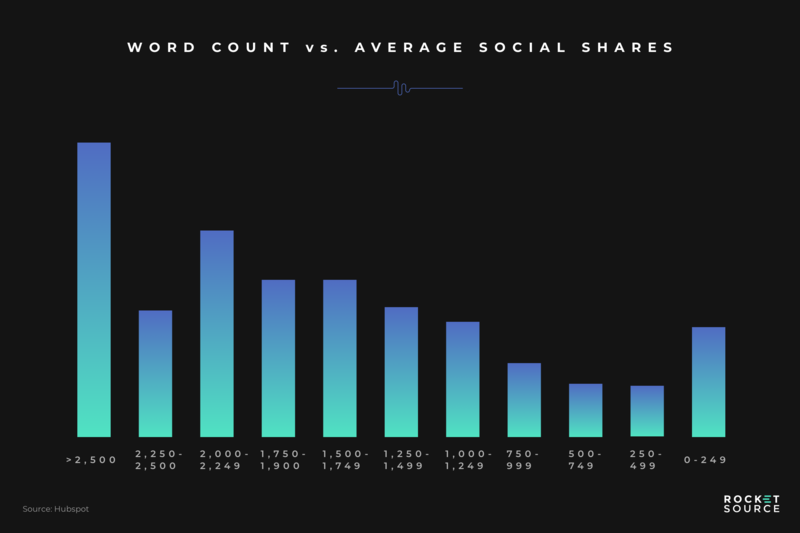 Of the 100 million articles they analyzed, they found that those over 3,000 words got the most shares on average. And then there’s the question of how those users find your content in the first place. After all, driving organic traffic by publishing your own content is an important part of content strategy. 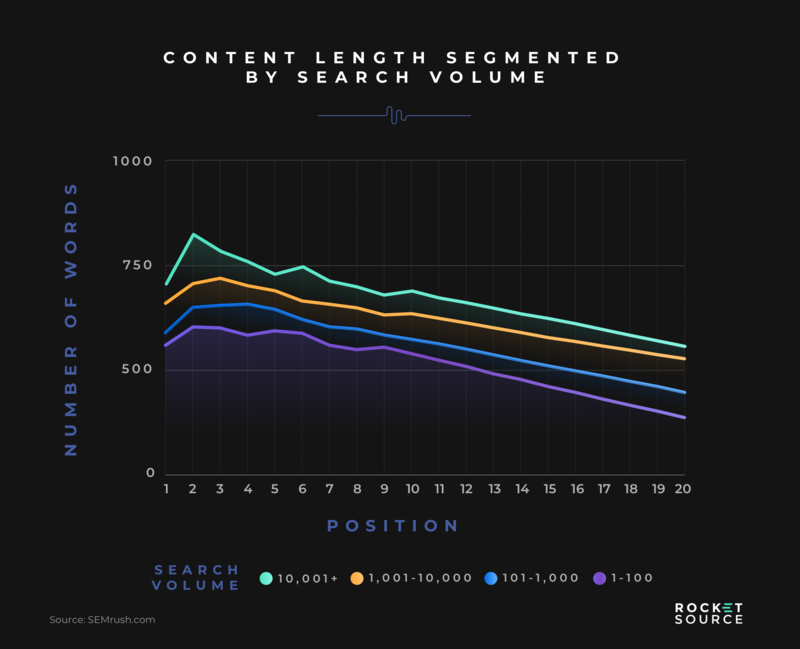 In a recent study by SEMrush on ranking factors, the results indicate that, on average, long-form content outperforms shorter content in search results. Notice how the numbers steadily drop after the first page. That’s only some of the data supporting my strategy—that well-written, long-form content excites your readers and earns you shares, backlinks, and revenue. And that’s the real challenge of good content marketing—getting people genuinely excited. To get people jazzed about your content, you cannot repeat yourself over and over and expect them to stick around or share your work. You have to generate interest creatively. It’s not just about getting your word count up—it’s a goal to get deep with each topic you discuss. The surest way to lose organic rank is to get people to bounce quickly from your pages. But if you keep people on your pages, Google will realize that you have something valuable to offer and will rank your pages higher. That’s why I was able to grow my businesses using only a handful of posts. I made every word of my articles valuable, which kept readers around longer, which in turn made Google take notice of my website and put me higher in the SERPs. But there’s one thing you’re probably asking yourself right now, something that I touched on earlier—who cares about traffic, shares, or rankings if it doesn’t lead to money in the bank? That’s a great question because revenue is the ultimate goal here. And long-form content is the secret sauce. Right now, I’m working closely with a Fortune 20 to achieve results with long-form content. We’re focused on crafting content that feels personal, engaging, and is based on cognitive associations—conveying relevant information that gets customers excited. The end result will be a modern overhaul of the experience a customer has on their website, which in turn will transform the ROI they realize on their digital and content marketing. But there’s more to this than word count. 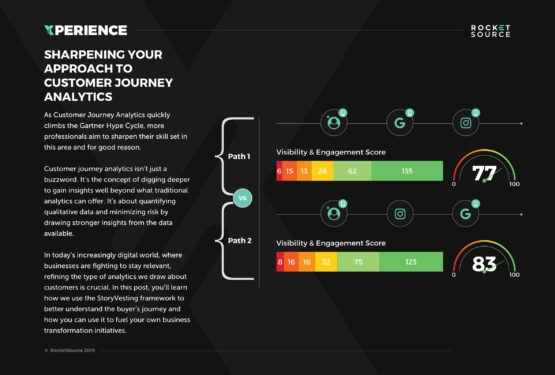 Even content that is engaging and backed with data doesn’t get you to the finish line—more like the halfway point. The next leg of the race is visuals, which play an equally important role in bolstering the person’s on-page experience. A big part of my own success has to do with focusing on excellent visuals. We just covered a lot of ground on content length, so I want to revisit an important point I mentioned earlier—your content must be personalized to be effective. Word count alone isn’t enough to keep people on your pages. Have you ever landed on an article that is just a wall of text? It looks boring, intimidating, and like it’ll be a chore to read through. Effective visuals immediately change that perception. When done right, they appeal to the audience, which in turn, helps keep your reader more engaged right from the first glance. It seems simple enough, but to understand why visuals are so important, you have to understand the journey your buyers go through. In the past, it boiled down to this—the marketing department would use its budget to capture leads. Then, those leads would get passed on to sales, who would call and pester until the lead turned into a sale. This old-school approach is wildly expensive and ineffective. That’s because it costs at least five times as much to attract a new buyer than it does to retain a loyal customer, according to Invesp. Forward-thinking brands can clearly see the error in the logic of spending more up front. This journey is too simplistic and it holds you back from realizing true growth. Enter the journey taken by today’s consumers. Today’s buyers are more informed, thanks to advanced consumer technology. The sheer number of touchpoints a person encounters on their path to purchase is higher than it’s ever been before. 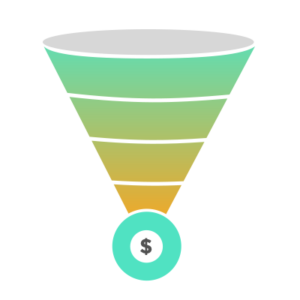 Take a look at the modern marketing funnel. You can see how much more complex marketing needs to be to see a higher ROI and realize your growth potential. 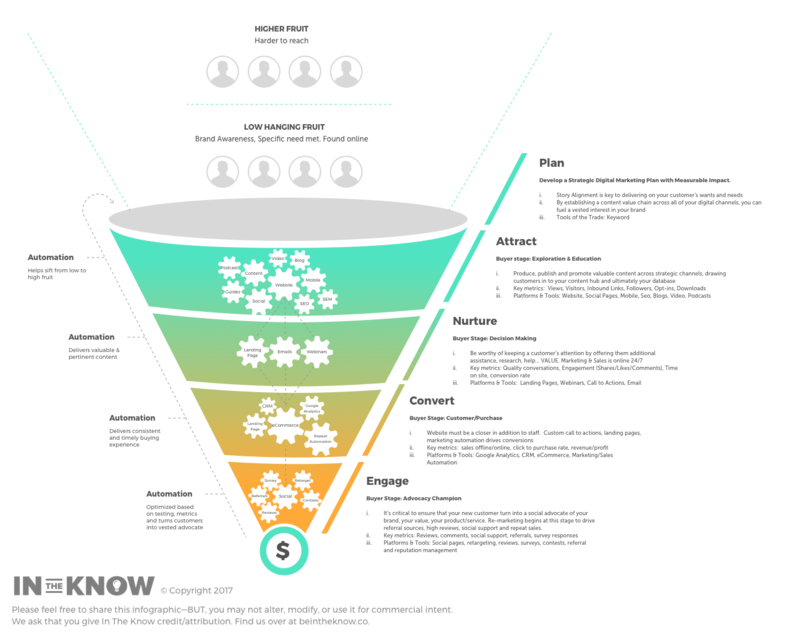 I’ve gone in depth on about how to optimize the marketing funnel for growth over at In The Know but for the sake of this post, let’s focus on where content marketing enters in. In fact, the content you create plays a major role in each stage seen here—planning, attracting, nurturing, converting, and engagement. Visuals, specifically, play an important role at the largest part of the funnel—the attract stage. Videos urge consumers to hit play. Infographics convey data much better than large chunks of text do. The imagery you pepper throughout your content creates momentum, and that momentum translates into a more engaged audience, which in turn translates into better SEO, more social shares, and a more loyal customer base. Visual media has grown in tandem with bandwidth. Images, video, and animated GIFs are a massive part of daily life. To give you an idea of just how popular visual media has become, the popular image-sharing service Giphy serves around 2.5 billion GIFs per day for users worldwide. Big players like YouTube, Netflix, Vimeo, and Amazon are contributing to the estimate that video will account for 80 percent of internet traffic by 2021. When I start working on a new article, one of my main objectives is to catch a reader’s attention right out the gate with an amazing visual. Here’s a graphic from a recent post as an example. We put a lot of work into our visuals so that they not only draw the reader in, but they also add depth to the content. We’ve improved our site statistics and rank for these images because we’ve done the legwork to make them easily shareable and relate it closely to the content. It’s effective to the point that many of our site’s links come from visual platforms, and our images are ranking on the first page of Google. I’ve given you a lot to chew on here, so by now you’re probably wondering what this looks like in the real world. How do you intertwine thousands of words with visuals and audio together to deliver a real return on your investment? Like many people, I enjoy watching videos. And some brands are really knocking it out of the park with their work. Meet Dude Perfect, a group that describes themselves as “five best friends and a panda.” They’ve amassed millions of followers and billions of views by creating videos featuring trick shots, Nerf battles, and many other themes. You’ll notice that there isn’t much of a story here. It jumps right into the action, and the brand placement is subtle. They understand their audience so well, they know exactly how to turn up the excitement, mix in some great background music, and partner with athletes and celebrities to keep the views and subscriptions coming. And they even have a TV show that is entering its second season. Another example you may have come across is the aptly-named Unbox Therapy, a YouTube channel dedicated to unboxing, showing, and briefly reviewing new or unique products. No, really, that’s just about all they do. If you’re not part of the target demographic for these videos, I don’t blame you for thinking that you probably have better things to do with your time than watch people playing around and opening gadgets. But remember that everyone needs to relax and unwind every now and then, and videos like these are how millions of people do just that. Consider a developer who is hunched over his computer for hours on end. He’s got plenty of coding to do, so he plays some of his favorite channels on a second monitor. While he’s listening, he occasinally glances over to see what the next flagship phone’s fancy new features are, then gets right back to what he’s working on. Then once he’s caught up, he switches back over to his favorite Spotify playlist. But these examples are brands in and of themselves—there’s not much to see here beyond the videos. They’re not selling anything to the viewer (though Unbox Therapy uses affiliate links to the products they feature), so here are some direct examples of a business using video to support a separate product or service. Kyle Hanagami is a choreographer who uses dance set to popular music to attract a huge audience. Altogether, his videos have received over 100 million views. Here’s just one of them, so you can get an idea of what his visuals look like. And here’s one more. LUSH Cosmetics creates vibrant, handmade bath products, and release videos that showcase the production process along with employee commentary that gives a face and voice to the people behind the products. But the video is just the beginning—they include a helpful description with links to the featured product, their Facebook page, mobile apps, and more. The video ends with an invitation to subscribe (nothing too original there) and leave comments on what they should make next. They are using the medium in unique ways, going the extra mile to engage directly with their audience. It stands out, especially compared to the countless businesses that upload self-serving case studies or drone footage of their new HQ. People aren’t buying the product from YouTube, but the millions of consumers watching are sold on the brand through the videos. In practice, your strategy isn’t going to be the same as another company’s even one in the same industry as you are. We haven’t talked much about other exciting channels and formats, such as webinars, infographics, communities, live broadcasts, etc.—all arrows worthy of being in the modern marketer’s quiver. But if you’re just getting started or not getting traction from what you have in place, don’t worry about those details just yet. To see true ROI from your content marketing, you have to have the full package. This starts with empathy for your audience. It requires you to understand not only who is consuming your content, but when and how they’re consuming it. Then, through this empathetic response, you can create personally appealing content that will attract your audience and keep them engaged. This doesn’t mean you can get away with quick snippets of information. You need to get deep enough to leave your reader/viewer/listener feeling like she gained something valuable from her time with you. You need to get personal through engaging visuals and audio. You need to go beyond the superficial. 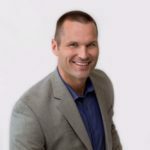 This is a far more advanced approach than simply using content to drive leads that will be shuffled off to the sales team and support departments. 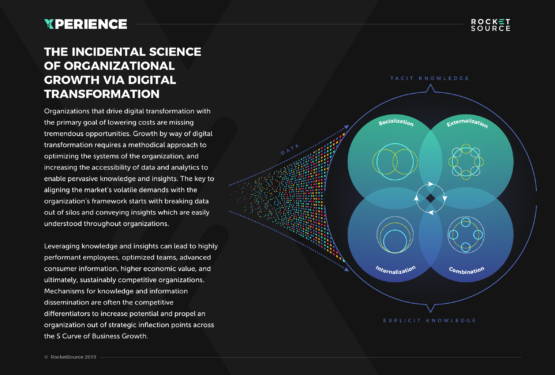 At RocketSource, we’re innovating alongside some of the most creative organizations, teams, agencies, consultancies, and integration companies around. Our strength is to ideate, orchestrate, and operationalize insulating models, strategies and highly agile solutions for our clients. What does that have to do with you? A lot, actually. When you bring all of this together, you’ll see an important pattern that you can implement to boost your content marketing ROI. You can personalize your content by moving away from an interruption based marketing plan and toward original media. You can create long-form content using visuals to keep your content engaging, and thereby keeping your reader on the page longer. You can use data to understand growth opportunities and invest in the areas giving you the biggest ROI. Doing all of this will ultimately lead to cognitive associations with your brand. Seeing a video will make a person think of you. Hearing a sound bite will make a consumer think of you. Ready to dive in? Hit pause for a moment. As exciting as this stuff is, there’s a lot of nuanced layers to it. I’d love to see you get moving in the right direction. That’s why we’re willing to offer you a complimentary assessment to help guide you on your content marketing journey. Fill out the form, share some information with me and my team, and we’ll be sure to set you on the right path forward.